After California: Which States Are in the Most Peril? California's crisis continues while Governor Arnold Schwarzenegger and legislative leaders inch slowly toward agreement on the deep cuts necessary to close the state's massive $26 billion budget shortfall. Now, even as California continues to pay its bills with IOUs, the University of California, the nation's leading public university, is being forced to cut its budget by $813 million  or 20%. It is highly unlikely that these cuts will be reduced by a budget agreement in Sacramento. 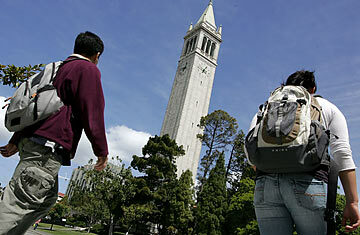 UC Berkeley, will see recruitment of faculty drop from the normal 100 positions a year to 10. At 28,000-student UC San Diego, ranked along with Berkeley and UCLA among the world's top 20 research universities, recruitment has been halted. More than 300 UC scientists have issued a white paper warning Schwarzenegger that the sharp reduction endangers the 10-campus system's position as the premier public university in the United States and could have a negative impact on California's future economic growth. According to UC officials, the cut in state funding brings the "amount of state investment in the University down to $2.4 billion  exactly where it was in real dollars a decade ago." During the same period, spending on state prisons has more than doubled, to $11 billion. The UC Board of Regents approved on July 16 an emergency budget plan that would force 80% of the system's 180,000 employees to take unpaid furloughs of 11 to 26 days over the next year. UC president Mark Yudof said the furlough plan was preferable to layoffs in an enormous system that includes five medical centers, three national laboratories and 225,000 graduate and undergraduate students. UC officials have yet to secure agreement on the furlough plan from the unions that represent 35% of university employees. But furloughs will only cover approximately a quarter of the UC deficit. The rest will come from a 10% increase in tuition, debt refinancing and dramatic budget cuts at individual UC campuses, as testimony to the Board of Regents from the system's chancellors revealed on July 15. At UC Berkeley, according to Chancellor Robert Birgenau, campus libraries will be closed on Saturdays and will no longer stay open 24 hours during final exams (a longtime campus tradition). He said UC Berkeley is "the only university among our competitors whose faculty are taking a furlough," adding that faculty salaries already lag some "$25,000 behind our peers." In the past, even with this gap, UC Berkeley has been able to entice top faculty to leave Harvard and Yale for the Bay Area. The UC system as a whole has won 55 Nobel Prizes. The retrenchment at individual campuses will mean fewer student jobs, fewer teaching assistants, a virtual elimination of lecturers (who often teach up to 30% of undergraduate classes in some departments) and the risk that top faculty will flee for more lucrative  and stable  ivory towers. At UCLA, the campus is projecting 165 fewer courses for the fall quarter, a 10% drop compared with fall 2008, Chancellor Gene Block said. There will be larger classes, which are expected to exceed an average of 60 students each. "We've already seen a 20% increase in the average class size over the last three years, due to increases in student enrollment not covered by state support," Block explained. At UC San Diego, Chancellor Marye Anne Fox said, "our student-faculty ratio is so high that students may not be able to graduate on time." In Sacramento, Schwarzenegger and Republican legislators have blocked all attempts by Democrats to cover any portion of the $26 billion shortfall with a tax increase. Tuition has more than doubled at the University of California in the past decade, rising to more than $8,700 for in-state students in fall 2009. Many of the budget cuts being negotiated behind closed doors will primarily affect the poor and the working class  including health coverage for the poor and the CalWORKs welfare-to-work program. But the severe funding reductions to public schools and to the university system  affecting not only the University of California, but also the 23-campus Cal State University system and the community-college system  will strike California's large middle class in a fundamental way. In a July 9 "Open Letter to UC alumni and friends," Richard Blum, the Regents' most recent former chair; Russell Gould, the current chair; Sherry Lansing, the vice chair; and UC president Yudof wrote, "The UC model  providing universal access to a top-notch, low-cost education and research of the highest caliber  continues to be studied around the globe among those who would emulate its success. And yet, this model has been increasingly abandoned at home by a state government responsible for its core funding."